Valley Lahvosh Nachos - A recipe from Savor California, the online showcase for extraordinary gourmet foods and beverages from California. 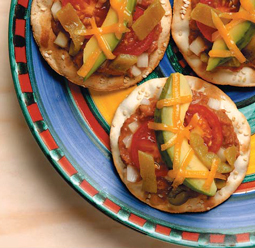 Spread each Round generously with bean dip or refried beans. Add tomato and avocado slices, shills and onions. Top with cheese and heat under broiler for 3-5 minutes, until cheese is melted. Garnish with olive slices, if desired.